A glugging sound fills the room as the liquid drains from the tube containing Itsuki. Eventually, the tube opens. Armor lifts Itsuki up and removes the blindfold and gag ball. I… kinda want to run away. His appearance is a gag in and of itself. I find myself holding back laughter. Itsuki slowly opens his eyes and drowsily looks around the room. You infiltrated my base and ran back here with your tail between your legs! From the Magic User’s testimony, they cut off their connections. I guess it’s all a matter of phrasing. But, the truth is leaking out. This man hasn’t called Itsuki by his real name once. I can assume that he still does not place any trust in Itsuki. The reason he ran all the way back here was because Itsuki was all he had left. Itsuki looks at me with a dazed expression, and he begins releasing a dark aura so thick that even I can see it. That’s the aura that surrounds a Hero devoured by their Curse. So what is it? What curse is eating at Itsuki’s mind? Out of all the people I’ve faced, it’s top class. It makes my blood go cold. He’s a troublesome fellow even right after he wakes up. Is it due to his curse, or was he like this from the beginning? It’s a delicate line. Rishia and Ren try to persuade him. But Itsuki’s gaze remains fixed on me, and he doesn’t even glance at the two. This man… I think I’ve heard him say similar things before. Isn’t that what slaves are supposed to be? Of course, manual labor requires appropriate compensation, but slaves are supposed to work without one, right? If you ask whether there’s a problem with buying and selling humans, I’d say there is one, but that’s just the sort of world this is. If you want an extreme analogy, then perhaps slaves can be compared to vacuum cleaners. Do you feel sorry for a vacuum cleaner for having to deal with the garbage on the floor every day? Slaves are like appliances. Convenient means to an end. Wait, something’s popping up in my head. Don’t mind it. Don’t mind it. He’s most likely talking about the girl tilting her head towards me and her older brother. I don’t know how much info he’s got, but he’s clearly cherry picking here. And for Witch to help a Demi-Human is more unlikely than a girl falling from the sky. Those nobles just barged into my place and demanded medicine, all while looking down on me. Also, I do have memories of giving medicine to the poor. After they pleaded to me with the few copper coins they could scrape together, the least I could do was give them some. And what is this? When did selling medicine to rich buyers become a crime? If I didn’t sell it to them, would you be shouting at me for denying medicine to those who asked? No matter what I do, it’s a crime. Stop screwing with me! Nope, nothing’s coming to mind. Couldn’t save? If it was illness, I would at least do what I could do. Though, I would demand some compensation, as little as it may be. Of course, people have tried to run away without paying. But, I simply asked around for their destination and apprehended them anyways. Do people hate me that much? Itsuki isn’t using any honorifics with me. But, I guess I’ll leave that as it is. I think I have an idea of who it is. Occasionally, when I go to villages, some people come to me asking me to bring their loved ones back to life. They come crying, carrying the dead bodies. There are people who come to me after hearing rumors of the Saint or the Hero of the Shield. Logic does not get through to those people. When I say I can’t do it, they continue pleading in tears. Some even transfer their anger onto me. I’ve had some corpses abandoned in front of my village. If I tried to give them proper burials, the culprits would come out and shout at me. I’ve had the soldiers send them out a few times. That’s why the sign on the village’s entrance says as such. The dead can never come back. Because of this, I’ve made it so that I only personally treat patients in the special clinic building. That Witch. She’s left me with an outrageous parting gift. Itsuki has no way of logically proving that statement to be false. What’s more, with Itsuki as he is, I don’t think that anything I say will be able to persuade him. Ren offers a plausible argument. There’s definitely a difference in defensive and offensive capabilities between weapons, but the effects themselves are generally the same. It’s something I learned from talking with Ren and Motoyasu. The only one who doesn’t know is the lonely Itsuki. But, perhaps I’ve just yet to find it. I can’t deny the possibility of there being a weapon that can bring the dead to life. And, if there were a single weapon that would have it, I guess it would be the Shield. But if I could use it, then I would. Who knows just how much I could rake in if I advertised that I could revive the dead? Upon my word, Itsuki turns his gaze to Armor. Itsuki sprouts white wings. Though they’re supposed to appear divine, they somehow give off a sinister feeling. He takes out a highly ornamental bow and shoots an arrow at Armor. And the Armor in front of me collapses forward. Did he dispose of a foolish subordinate? As I thought that, Armor suddenly rises from the floor. Armor’s behavior is clearly strange. What is that bow’s ability? It’s without a doubt the foundation for those daggers. His face is not one led by his own ambition. It’s not the one that only strived for self-satisfaction. Just like the brainwashed people, he carries an abnormal expression filled only with a lust for Justice. As Ren points his finger at the Bow, Itsuki answers with a bright smile. Sword and Game it's a new literary genre that comes from Asia. Somewhere between fantasy and science fiction, although extremely close to reality and what might be true in a few years. The sword and game has very strong affinity with the sword and sorcery, but the adventures of the characters of the sword and game story take place within MMORPG games which can be accessed through a virtual reality systems do not yet exist, but to which you are doing for decades of attempts, so it's stories set in near future, but with fantasy settings. 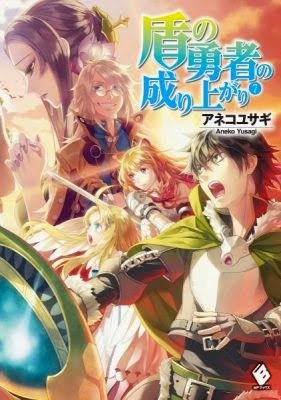 There are similar works but with contamination as Arifureta, Tate no Yuusha no Nariagari and the webtoon The Gamer.